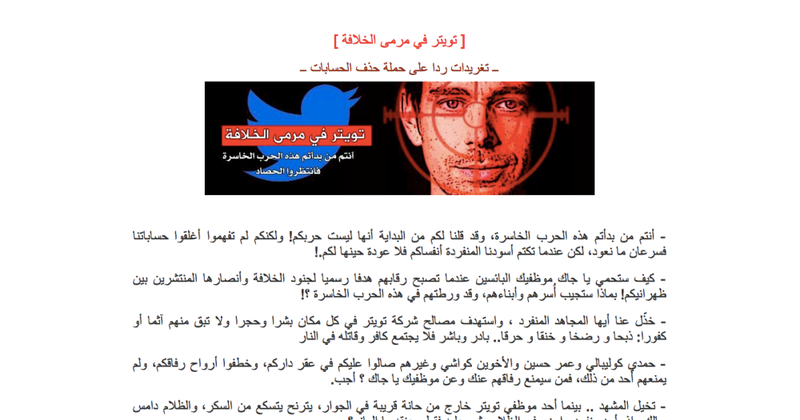 Earlier ISIS supports have threatened to kill U.S president Brack Obama family and now again ISIS supporters have threatened Twitter co-founder Jack Dorsey as well as company employees because the terrorist organization’s accounts are frequently deleted from the social network. The post was posted on the JustPaste, which was first seen by the BuzzFeed. The post features an image of Dorsey with cross-hairs superimposed. There are lost para of the message which were written on the Arabic language. It reads, “Your virtual war on us will cause a real war on you." “You started this failed war. We told you from the beginning it’s not your war, but you didn’t get it and kept closing our accounts on Twitter, but we always come back. Twitter’s terms of service allow users to post “potentially inflammatory content,” but it draws the line at “direct, specific threats of violence against others.” The company has also cooperated with the British government to delete content which violates UK terror laws. Twitter team taking the incident seriously and said “our security team is investigating the veracity of these threats with relevant law enforcement officials.”.